There’s not much contention when it comes to the halal food cart game, especially when you’re talking about the sauce. 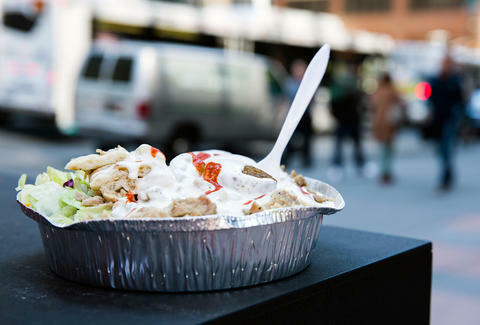 By almost all accounts, The Halal Guys -- the cart with the perpetual line in Midtown -- are cited as the gold standard for white sauce. 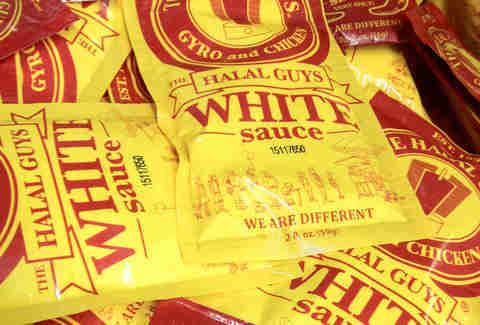 People have been trying to recreate it for years; many imitators have failed and some have come close, but given their recent expansion plans, and the release of their sauce packets (which came really close to revealing the secret), there’s newfound interest in what the hell exactly is in white sauce. So I set out to try and break the code, to provide the best-yet recipe for all you amateur sauceologists out there. While their recipe for chicken and rice comes straight from home in Egypt, there’s no translation for their white sauce -- part of the reason they didn’t bother coining a name for it. Customers actually called it "the white sauce," and that was that. And aside from a small tweak made in 1993, the recipe has remained unchanged all these years -- you don’t mess with perfection. I’ve tested many of the copycat recipes out there, and agree with Hegazy. Most other carts serve something that just tastes like watered down mayonnaise, and many recipes found on the internet aren’t even halal. One of the most popular hits out there is the blog Endless Simmer’s version, which uses a combo of mayo and ranch dressing, which is way too overpoweringly ranch-y and not nearly tangy enough. Tasting this one, I realized garlic and onion powders didn’t belong in the white sauce at all. Serious Eats took a stab at it, too, combining mayo with Greek yogurt. I thought it was too sweet, and still not tangy enough. The dairy smell was also too strong. The major component these recipes were missing was the aroma. White sauce smells refreshingly light and flowery, which led me to this: it’s all about the herbs and spices. That made my task slightly easier. I now just needed to buy vats of mayonnaise and mess around with it. Just another Wednesday at the Thrillist Test Kitchen. Aside from that one major clue, I also had their brand-new sauce packet’s ingredient list as a starting point: soybean and/or canola oil, egg yolks, vinegar, water, salt, sugar, natural flavors, black pepper, xantham gum, and sodium benzoate. The first six ingredients are mayonnaise. There’s no added dairy, because that would have to be stated. The “natural flavors” is where the magic is. I went crazy at my favorite spice shop, buying all kinds of packets and bottles, and in the end settled with four: caraway, turmeric, cardamom, and sumac. Lemon juice and sumac give the sauce its strong citrus flavor. Caraway brightens it up, giving it that refreshing note. Cardamom provides the flowery aroma. Turmeric enhances all those flavors and gives the sauce an ever-so-slight yellow tint, which matches the white sauce perfectly. I watered down the mayonnaise first, because the flavor needed to be subdued, then used xantham gum to thicken it back up. I think it comes pretty damn close. While The Halal Guys may be coming soon to a storefront near you, they’re never going to give you as much sauce as you want -- fill my inflatable pool, please -- and they’ve finally started charging for extra. Keep batches of this sauce in your fridge and you’ll never have to be that person ever again. Whisk mayonnaise, water, and lemon juice together until smooth and no lumps appear. Add caraway, sumac, cardamom, and turmeric; stir until combined. Add xanthan gum and mix until it thickens slightly. Store in the refrigerator. Use liberally.